Solar wind from the sun is apparently creating spectacular auroras for skywatchers in northern latitudes around the world. And more dazzling northern lights displays are expected tonight. The aurora activity spiked early yesterday (March 1) when a solar wind stream slammed into Earth's magnetic field to create what scientists call a geomagnetic storm. NASA officials said that the event began with a relatively minor polar geomagnetic storm, but by late Monday it had intensified into a major cosmic tempest. "Spotters are now reporting auroras over Northern Ireland, Latvia, Norway, and Sweden. If the trend continues, high-latitude sky watchers will likely witness bright auroras after nightfall on March 1-2," explained astronomer Tony Phillips in an announcement from NASA's Goddard Space Flight Center in Greenbelt, Md. " Northern-tier U.S. states such as Maine, Wisconsin, Minnesota, and Washington could be favored with photographic and/or visual displays." The image was taken in darkness at Poker Flat, Alaska, where Spann is attending a scientific conference to study auroras. It shows a dazzling green ribbon over a dark landscape with a dome in the distance. Auroras occur when solar wind particles collide with oxygen and nitrogen atoms in Earth's upper atmosphere. The atoms are excited by these collisions, and typically emit light as they drop back down to their original energy level. The light creates the aurora that we see. Green is the most commonly observed color of aurora. It is caused by the light emitted by excited oxygen atoms. The sun is going through an active phase of its 11-year weather cycle. In February, it unleashed several powerful solar flares, including one that was the most powerful flare detected in more than four years. Auroras in the Northern Hemisphere are called the Aurora Borealis (Northern Lights). 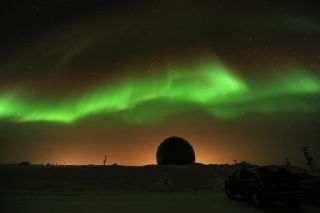 Auroras also occur at the South Pole. These are called Aurora Australis (Southern Lights).